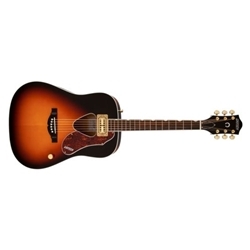 Gretsch Rancher acoustics are back and better than ever! The G5031FT Rancher dreadnought is a distinctive Rancher model, with a sweet iso-chamber mounted Fideli’TronTM pickup for great amplified tone and performance. Other premium features include a bound solid spruce top with scalloped "X"-bracing and the classic Rancher bound triangular sound hole, flame maple sides and bound arched back, mahogany neck, 16-fret rosewood fingerboard with Neo-ClassicTM “thumbnail” inlays, volume control, compensated bridge saddle with rosewood base, deluxe tuners, and gold-plated hardware.